Charlottesville is a town where the past and present make a great combination. The evidence is in the mixture of traditional and contemporary styles of the homes that you can find here. You have to come and see the place for yourself and experience the breathtaking view of these architectural masterpieces. Homes in Charlottesville are made of different materials, infused with different styles and techniques unique to each architect and designer. Many have been around for years, carrying with them a rich history that is a common characteristic of many Charlottesville homes. Discover in the list below some of the top architectural styles you may want to consider for your next home. The most common home style that you will find in Charlottesville and Central Virginia is colonial.The area is steeped in tradition and history which sets the stage for a colonial style home. Many of these homes are brick and two story. Some of the larger historic homes will have large front porches with white columns. One of the most popular style in newer homes is the craftsman style. These homes may be either one level or two story. You will often see stone and other natural materials used as accents particularly on the exterior. The inside trim details such as the crown molding is of a very simple design. These homes give a very clean, elegant appearance. Charlottesville horse farms are among the most common type of property in town. Charlottesville offers everything a horse farm can ever want and need in order to thrive such as vast pastures and great weather. These farmhouses often have chimneys and gable roof. These homes are also never short on space. They often come with generous spaces in the backyard enough to take care of horses and other farm animals. The two story design and welcoming front porch are distinguishing features and each home has its own unique addition to the traditional porch such as swing-type seats and potted plants. It’s definitely a splendid experience walking through the streets of homes for sale in Charlottesville VA. There’s an abundance of unique, cozy and beautiful homes in town and a lively community. 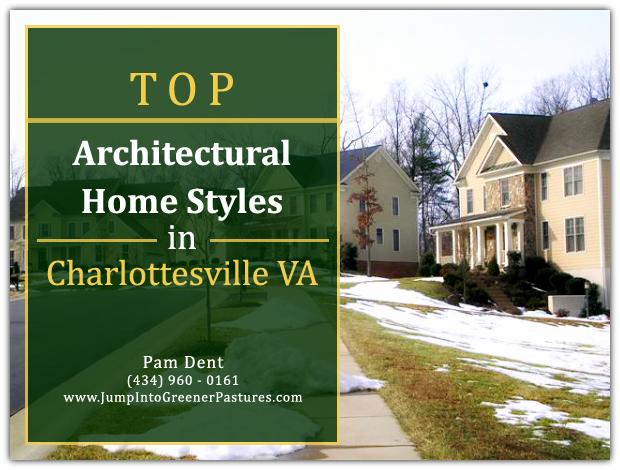 For more information and inspiration on different architectural home styles in Charlottesville, visit this website today www.JumpIntoGreenerPastures.com. Managing and maintaining a horse farm is not an easy task, however, it is something that every horse owner should incorporate into their daily routine to keep their horses in tip-top shape. Getting all the help you need to maintain your Charlottesville VA horse farm is certainly beneficial; and this starts by having the right equipment around. Here are some essential pieces of equipment that you’ll need to have in your farm. Transportation for your horses is one of the first things that you should think about. The number of horses you will move and the distance you will generally travel will determine the kind of truck and trailer you need to buy. Trailers can range in size from a two horse tag along trailer to a 5 horse head to head gooseneck to a tractor trailer. While a two horse can be pulled easily by a Subarban or a ¾ ton pick up truck, bigger trailers would mean getting a truck with higher towing capacity—something that you should discuss with your car dealership. You want to make sure that your horses get the best level of comfort in your horse farm in Charlottesville VA and ventilation is important. Stalls can get a little bit warm and stuffy, so installing stall fans will keep a steady flow of air into and out of the stable. The right kind of stall fan should be installed in your barn. Simple house fans or box fans do not have their motors sealed and can be permeated by dust. This can cause the motor to malfunction which may lead to a fire. You should always use commercial-grade fans wherever possible. Exhaust fans in the loft or peak will help keep the barn comfortable in the summer months. Yet another basic tool is the handcart. This load carrying equipment is very easy to use, convenient to store, and requires almost no amount of maintenance (except for washing it on occasion). The market is filled with amazing options. Many are designed so that they can be moved easily even on uneven ground. All you need to do is find the one with a size that is enough to transport all the materials you move to and fro on the farm. In taking good care of the entire horse farm, it is important not to forget about the soil. Keeping the soil healthy is also a part of keeping your Charlottesville VA equestrian property in its best condition. A fantastic idea to contribute to the health of the soil is the use of a manure spreader. Since manure is a great source of fertilizer for crop production, its proper management can be used to cultivate feeds for your horses. And of course you will need the proper size tractor to pull your manure spreader and mow the fields. 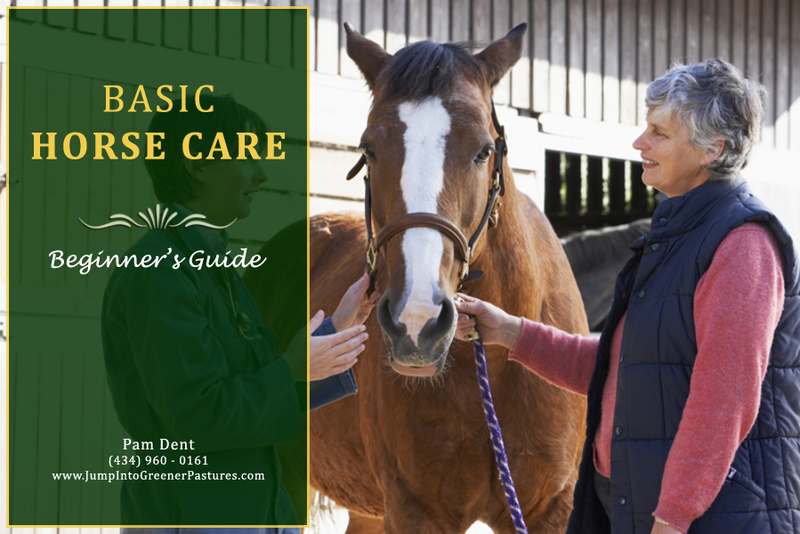 Having a well-maintained horse farm will ensure that your horses are in their best condition―and having the right equipment around is the first step. For more information on horse farms and other equestrian properties for sale in Central Virginia, please visit, www.JumpIntoGreenerPastures.com. Call me, Pam Dent, today at (434) 960-0161. I have the professional and expert knowledge of the local housing market in Charlottesville including equestrian properties, golf communities, and other homes for sale across Central Virginia. It is my pleasure to guide you through the exciting journey toward finding the home of your dreams. For those with a passion for books and reading, there are a number of places where you can find great reads near homes for sale in Charlottesville VA. The city is home to a number of great bookshops that cater to all kinds of readers and collectors alike. Whether you are looking for new and contemporary books, used books and even antique items such as old maps, you may just find what you are seeking in any of these well-loved bookshops in town. Have you ever been surrounded by towering walls of books? Many have been mesmerized by the sight you’ll see at the Daedalus Bookshop. Their collection of books covers a wide range of academic topics that many customers commend them for. Frequent customers admit to spending hours and hours just browsing through the bookshop’s collection until they’re able to find a book to their liking. It’s like a whole new experience for them every time they come into the shop. The service at Daedalus Bookshop is very impressive. The staff is welcoming and accommodating, especially when customers come in looking for a specific title. Many customers have had successful adventures finding hidden book treasures among the towering shelves of books. It’s definitely a bookshop to visit that will leave you with an unforgettable experience. Charlottesville horse farms have plenty of space for relaxation and enjoying a good book. One of the most frequented bookshops in the city is Blue Whale Books. They offer a collection of used and rare books. Customers really enjoy going through their mystery and art topics. Blue Whale Books is also proud of its unique and antique items. Many people have bought old maps, rare books and illustrative drawings from this bookshop. In addition to their fantastic collection, customers feel relaxed and happy with the wonderful jazz playlist that accompanies their shopping experience. All you need to do is take a trip to the Downtown Mall and you’ll be able to find yourself lost in a collection of marvelous books and items. Wouldn’t it be an interesting find to discover a book on Charlottesville golf homes? It is quite remarkable that books are actually becoming more and more specific and it will not be impossible to be able to find a book on these golf communities in the near future. One bookstore where you might find this kind of book in the future would be the New Dominion Bookshop. It is an independent bookshop that locals are familiar with. Patrons take their time browsing the collection. Many commercialized bookstores only have a set of certain books in their collection. However, in a bookshop like New Dominion, expect to see unique, new and interesting books that are not supported in big commercialized bookstores. Thinking of moving to Charlottesville? Please feel free to visit my website, www.JumpIntoGreenerPastures.com, to know more about homes for sale in Charlottesville VA. 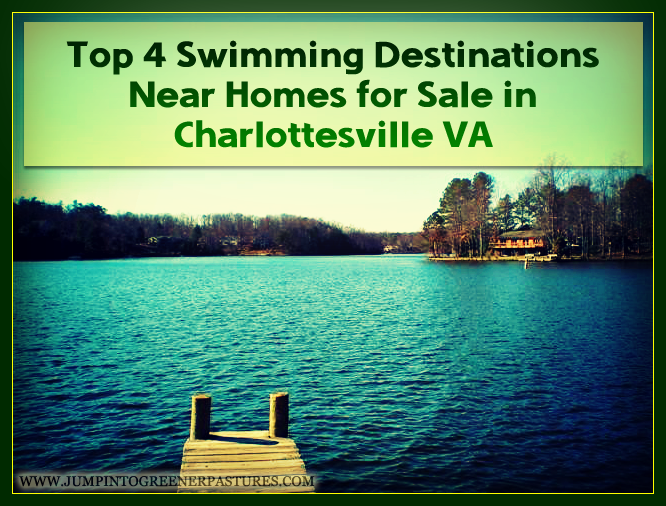 There is a variety styles of homes for sale in Charlottesville VA. Many homeowners enjoy decorating and personalizing every part of their home. A particular part of the house that gets immediate attention is the kitchen. Since this is where meals are prepared, the kitchen has the ability to bring families and friends together. You will be amazed at how storage design and functionality has been transformed today. Designs are now more creative, more contemporary and most of all more efficient. The aesthetic aspect of innovative storage nowadays comes with well-thought out designs that feature ease of use. Technology has also definitely made its way into Charlottesville horse farms. Automation is finding ways to make daily tasks even simpler, which in turn saves time and energy. Automated soap dispensers, faucets and light fixtures are examples of these time and energy saving devices. The future of automation is very promising; the possibilities in the kitchen are limitless. Today, the kitchen is not only seen as a place where food is cooked but it is a place where one can relax and spend time with family. It is a place to explore hobbies in cooking or maybe baking. One way to make your kitchen stand out is to use bold fixtures. Along with the birth of new and creative storage solutions, fixtures have developed into designs that are unusual in size and shape but still serve their purpose well. If Charlottesville golf homes are surrounded by the color green, kitchen trends today are choosing the color gray to decorate contemporary kitchens. Many of these kitchens would have the owners’ choice of gray primarily on the walls and on countertops. The rest of the kitchen would follow the same theme coordinating the appliances, fixtures and kitchen tools. Aside from the color gray, contrasting colors have also become very popular in kitchens. One of the most popular combinations would be black and white. This kind of trend really makes the kitchen stand out. It also keeps the kitchen’s design very simple yet sophisticated. These are just some of the top kitchen trends today. 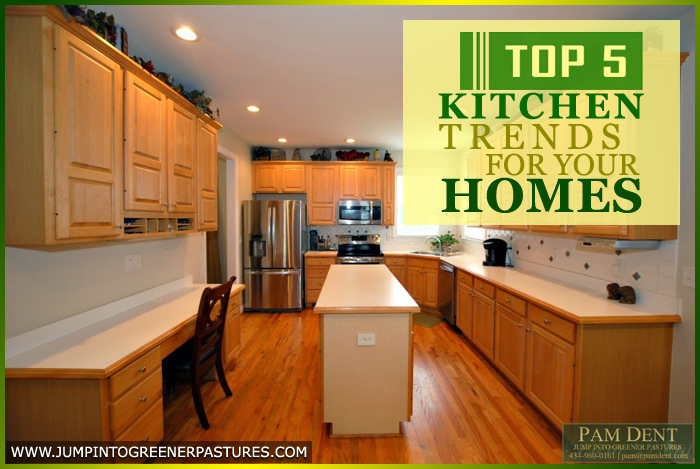 There are more trends out there that might suit your taste. Get more ideas for homes for sale in Charlottesville VA at this website www.JumpIntoGreenerPastures.com.